• NOTE: To ensure bag is fully protected in transit to you, the exterior surface of the shell is wrapped with a clear plastic film. Before first use, simply peel film off and discard, then show off your sleek-looking bag! Sometimes the look and feel of high quality luggage is all we need to rouse our desire to travel. That's why we're introducing our ultra-durable and impressively lightweight Starke hardside luggage. The robust shell and sleek color of a stylish case, the sound of smooth spinner wheels gliding through the concourse. Knowing all of your belongings are organized and secured in a reliable case that will arrive with you to your destination, completely protected by the TSA lock and anti-theft zipper. It's intelligently engineered and stylishly designed to suit all travelers' wants and needs. Conveniently, the recessed wheels allow the bag to meet FAA bag requirements, while not taking away from the packing space inside. Whether you're traveling for work or for play, this Starke 30" hardside luggage will help you get to your destination with ease and in a breeze thanks to all of the deluxe features. What exactly is meant by 28-32 checked - extra large? We usually travel first class, so would we be charged extra? According to the specifications, the overall dimensions (31" length + 21" width + 13" height) are 64". Are these dimensions correct? if they are then they exceed the 62" overall dimension requirement of most airlines which means they will be treated as oversized luggage incur an additional fee. Please confirm. I am planning to buy the 22", 26" and 30", can they be nested one inside the other for easy storage? 1). The dimensions listed do not conform to the 62 inch combined max set by most airlines? 2). To get service under your warranty, is it necessary to return the bag to you or do you have authorized repair shops nationwide? A MUST FOR ANY TRAVELER! PROS: I HAVE BEEN TRAVELING IN MY CURRENT JOB FOR 15 YEARS PLUS. I HAVE GONE THROUGH AT LEAST 7 SUITCASES. I NOW HAVE 3 OF THESE SUITCASES AND THEY ARE GREAT. ALL THE THINGS IN THE VIDEO ARE SPOT ON PLUS THEY DID NOT MENTIONED THAT THESE BAGS REPEL WATER. I HAVE HAD SEVERAL CASES WHERE MY BAGS GOT SOAKED WHILE BEING LOADED ON MY FLIGHTS. THIS SUITCASE I NOW HAVE IS 4 YEARS OLD AND STILL DOING GREAT. I PURCHASED ONE FOR MY WIFE AND ONE FOR MY DAUGHTER. 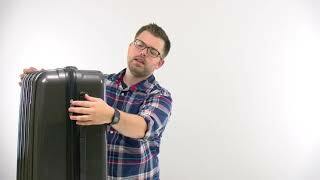 THIS MAY BE THE LAST SUITCASE THAT I WILL NEED TO PURCHASE! PROS: The size of this suitcase is perfect for a week long trip or more. It is well made and sturdy. It was wrapped in bubble wrap on arrival after I purchased it, and contained small containers that can be used for packing small items. CONS: Nothing I don't like.